Change the folder if the tracks are stored in a folder structure. ► The system displays the track list. ► The system begins playing the selected track. 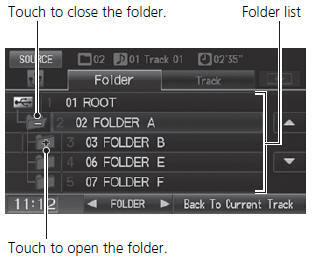 • Any music tracks not in a folder are automatically added to a “ROOT” folder, which is displayed at the top of the Folder List. • If the root folder has additional folders in a lower layer, they are listed on the screen.